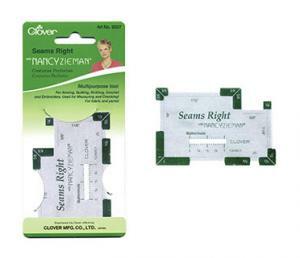 Clover Seams Right is a multipurpose apparatus for sewing, knitting, weaving, crochet and weaving. Utilized for measuring and checking. Use for measuring trims, buttonholes and sewing guage. Perfect for pressing folds and ideal for pocket corners. Quick and easy tool for marking seam allowances. 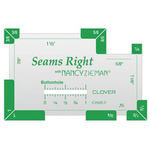 The Clover Seams Right measuring gauge is one of the most useful measuring tool for sewing and knitting ever devised. Almost everything we do in sewing and knitting requires some measuring function and the more precise the measurement the better our result. The most often used measurements of 1/4", 3/8", 1/2", 5/8", 3/4" and 1" are prominent and are easy to identify. The Seams Right is made of sturdy aluminum so it's easy to use while manipulating your fabric or checking seams while sewing. It's a virtual reference tool in your hand. Accurately measure seam allowances ranging from 1/4" up to 1-1/8"
Precisely measure buttonholes and buttons of 1/4" up to 1"
Quickly measure common increments of 1/4", 3/8", 1/2", 5/8", 3/4", 7/8", 1", and 1-1/2"